“Oxford Town Company” was the first business to open in 1871. This changed the town name to Oxford. Many citizens hoped this name would place the town on the same educational status of Oxford, England. Oxford established the first school district in Sumner County. A newspaper, hotel, schools, churches, and a mill helped the town grow quickly. Oxford was the first school district established south and west of the Arkansas River. For many years it was known as school district #1. The first teacher was Minnie Whaley. When it was planned, the organizers hoped our schools would become a center of higher learning, possibly even having a college. Thus Oxford has a large campus, and the name of the street in front of the elementary school is College Street. Oxford has had several school buildings in the past 138 years. The first school house was a one room wooden building built in 1871. It was built near the center of town and was moved many times until it finally rested on the west side of town. In 1872, a two-story stone building was built. This was used for all classes with a tower being added later for the high school classes which were organized in 1895-96. In 1913, a new building for both grade and high school was built; and in 1927, a new high school building was started. The first classes were held in the fall of 1929. In January 1930, the grade school burned down. A new school, the one used now was erected. The newest high school was completed in 1967, with additions and remodeling later. Oxford is known for The Old Mill. The mill was built in 1874 by D. N. Cook and John Hewitt. A three mile race was hand dug parallel to the Arkansas River. The water running through the mill race provided the electricity necessary to run the mill. A dam was built across the river to help the mill grow. The mill’s flour and cornmeal supported the slogan “Oxford’s Best”. In 1910, Charles Champeny bought the mill in which he worked until he passed away. The Old Mill has since been restored by its owners. 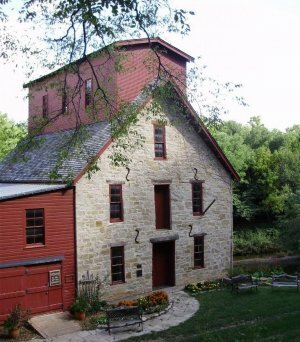 The Old Mill was placed on the National Historical Register on April 26, 1982. The Oxford Jr/Sr High School Entrepreneurship Class has recently started serving dinners on weekends. Please see the Public School page for the link. The first store in the town, and as Oxford was the first town in the county to be settled, it was a pioneer store of Sumner County. First public building in Sumner County to sell land to the settlers. Neptawah (later changed to Oxford) Post Office opened. Closed June 23, 1871. Sawmill started by T.R. Donley and J.T. McMillan. The Oxford Times was the first newspaper published in Sumner County. First school district established south and west of the Arkansas River. First railroad project, Independence, Colorado, Arizona and Pacific Line meeting was held in Oxford, but no action was taken until 1878. Oxford was Incorporated as a 3rd class city. The population was 263. Santa Fe Railroad came into Oxford, Cowley, Sumner & Ft Smith Railroad was a branch of the Santa Fe Railroad. Southern Kansas Western Railroad was completed to Oxford. Missouri Pacific was built after the Santa Fe and removed after the big flood in the late 40’s. Midland Valley was established in Oxford. Removed in 1969. A watercolor painting of Chief Black Dog from the Little Osage, which was created and donated by Marty Capron, is displayed in the Oxford Public Library. Capron states this painting is based, in part, upon a painting of Black Dog by George Catlin in 1834 and upon photographs of Black Dog's son. No photos exist of the elder Black Dog. He is pictured with traditional Osage hairstyle and tattooing, with a Plains Grizzly Bear claw necklace and trade pipe-ax. Black Dog was blind in his left eye as a result of a childhood injury. Black Dog engineered the trail that bears his name from Chetopa, KS to Oxford for the purpose of travel to trade and hunt. His camp near Oxford may have varied from year to year, but was usually on the high hill north of Oxford now known as Sleigh's Hill. The trail and campsite in the background of this painting are as shown in T.E. Newman's book, "Black Dog Trail", and are in agreement with the historical record and Osage Tribal history. Cave Park's Highway 160 entrance bears a sign stating Black Dog's Trail.